Find out why jicama is so good for you and enjoy it in this quick, easy, and delicious spinach salad. When you serve tacos on Tuesday nights, do you have a go-to veggie to serve on the side? 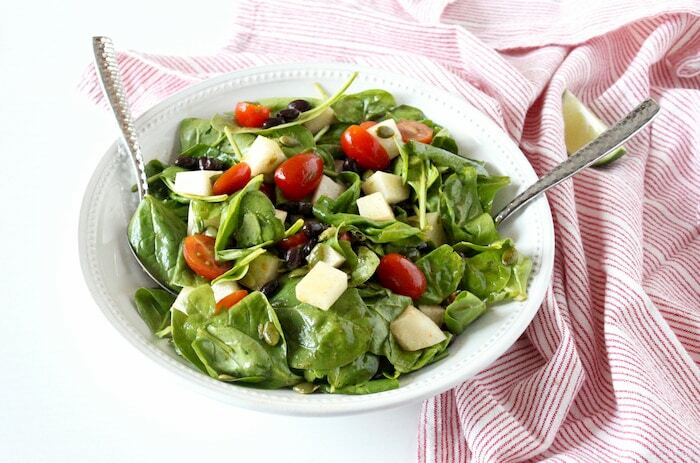 If not, then this Spinach Salad with Jicama recipe is for you! Have you heard of jicama? Pronounced HIK-uh-muh, this Mexican yam or turnip is a root vegetable with a brown, papery exterior and a white crisp interior. It may not look so interesting or appealing from the outside, but trust me when I tell you it is quite delicious on the inside, and in this spinach salad with jicama and black beans. Jicama is a crunchy vegetable with a slightly sweet, nutty flavor. It’s sort of a cross between a potato and an apple or Asian pear, although not quite as sweet. In fact some people find jicama a little bland, but when paired with the right ingredients it’s most definitely not! Jicama is most commonly eaten raw in salads, slaws, or added to a crudite platter. Jicama sticks or chips are a delicious and healthy replacement for traditional chips to scoop up guacamole. Jicama can also be the star of the salad show like it is in this Avocado, Jicama, and Cucumber Salad and Grilled Pineapple, Black Bean, and Jicama Salad. 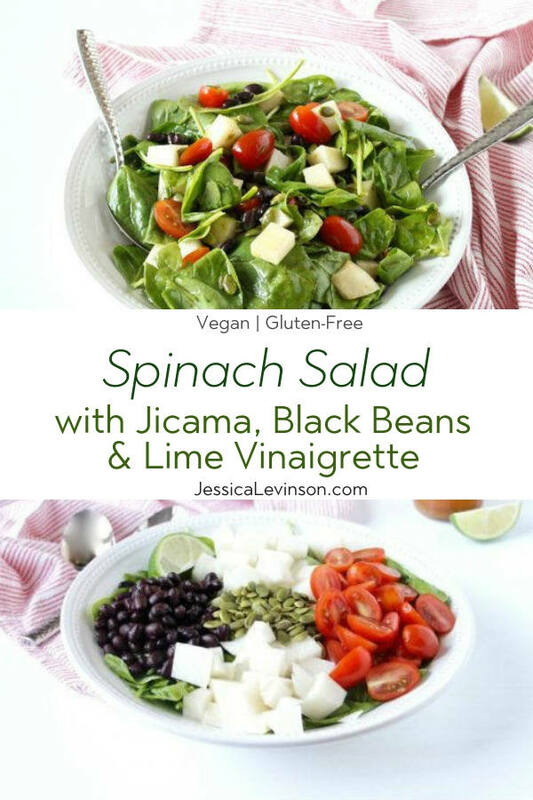 As you can see, jicama pairs very nicely with Mexican flavors, which is why the spinach salad with jicama below is my go-to side dish any night I make a Mexican-themed dinner like fish tacos or my Sweet Potato Black Bean Quesadillas. You can also cook jicama, although I have yet to try that out. Stir fries are a great place to incorporate this root veggie since it stays crunchy and absorbs flavor. I bet it would also be good sautéed with peppers and onions for fajita night! Now, back to using jicama in the kitchen. I used to peel the papery skin of jicama with a vegetable peeler, but I learned over the years that this was not the most efficient technique. Instead, the best way to peel jicama is with a chef’s knife. Uncut jicama will last in the fridge for about two weeks and cut jicama will last for a few days. And don’t worry about browning – this veggie will retain the same creamy white color even once it’s cut. 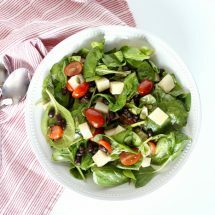 As I mentioned, this Spinach Salad with Jicama, Black Beans, and Lime Vinaigrette is my go-to Mexican night side dish. I first shared this recipe back in 2013, but it has since been updated with a few tweaks to the recipe. I hope you give it a try and enjoy jicama as much as I do! 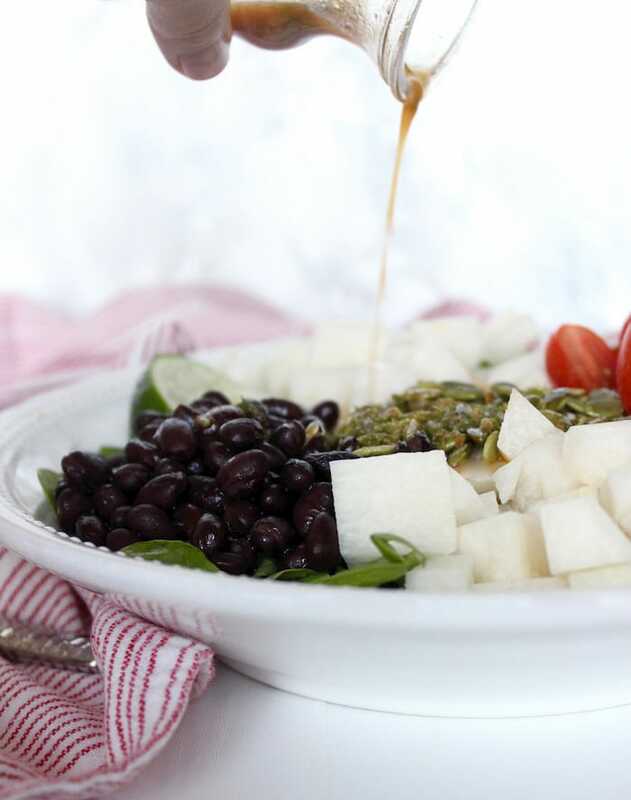 Crisp spinach, crunchy jicama, juicy tomatoes and tender black beans are tossed with a smoky lime vinaigrette in this quick and easy side salad that's the perfect accompaniment to your favorite Mexican-inspired dinner. Vegan, dairy-free, and gluten-free. 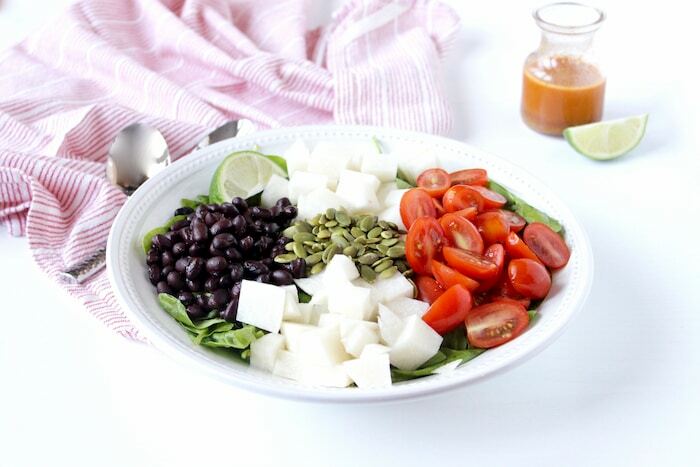 In a large salad bowl, combine the spinach, jícama, black beans, tomatoes, and pumpkin seeds (if using). In a measuring cup or small mixing bowl, whisk together the olive oil, lime zest, lime juice, cumin, chili powder, and salt. Pour the dressing over the salad and toss to coat. Enjoy! Have you ever tried jícama? How do you like it prepared? Share with me in the comments below! This post originally appeared in January 2013. Thank you! And thanks again for the awesome pics! This sounds very lovely and super yummy! I’ve NEVER cooked with jicama but you all have me really craving it! Those photos are gorgeous too! I love Mexican food so I am thinking I am going to have to rotate this in- thanks! Thanks Liz! You must try it – I really think you’d enjoy it. Just my foodie RDN intuition 😉 And yes, Kaleigh’s pics are amazing!! Great recipe Jessica! I always forget about using Jicama, but I bet the “crunch” is fabulous is this salad. I got a chance to try Jicama Chips at Expo West this year, and thought they were pretty tasty. Can’t wait to try this! Thanks so much EA! I absolutely love the crunch without any fried or salty add-ins. Most of the crunchy salad toppings aren’t quite healthy as you know! I bet those Jicama chips were great! I’m a sucker for a good salad! This one looks great and I’ll have to pick up some jicama and give it a try. It’s so yummy! LMK if you make it Sarah! You always make the best fresh salads Jessica. That dressing sounds so wonderfully savory and flavorful, too. Aw thanks so much Alisa. I love a good salad chock full of delicious ingredients. And the dressing is definitely delish! Thanks so much Kelly! LMK if you give it a try! I love jicama – so crunchy and refreshing! I recently heard Rebecca of Strength and Sunshine say she likes it roasted. I have never tried it cooked either, but sounds intriguing. Anyway, this salad looks delicious! Yes! I love the crunch! I will have to check out Rebecca’s post about roasting it – I should give that a try! I have never cooked with this! When you cook all the time, finding new things to try is always super exciting! I MUST try this! I agree it’s fun to try new things when you’re used to cooking the same old! This is definitely a must make salad! Looks so delicious and a great way to use jicama! Thanks so much Taylor! You’ll have to let me know if you give it a try! Yum! Spring and summer feel like salad and smoothie season to me. Definitely need to try that vinaigrette. My girls have been on a major smoothie kick lately, but I agree with you – they’re more spring and summer for me. LMK if you try the dressing! I love a good spinach salad! And this one looks delish! Especially the lime vinaigrette! YUM! Thanks so much Sonali! Let me know if you make it!